A few days ago, my sister-in-law was wonderful enough to take all three of my children so my husband and I could spend a day in the city kid-free! I ♥ her. We went to Bleeding Heart Bakery for a late breakfast and after looking at cases upon cases of delicious looking cupcakes, cookies and other sweets, I chose a broccoli quiche. My husband couldn’t believe it. But, with all the desserts that I bake, I really wanted something savory and it was delicious. My husband chose a giant whoopie pie, but was disappointed that it wasn’t nearly as good as mine. I tasted a bite and couldn’t help but agree. 😀 After breakfast, we had time before the movie, so we decided to browse some at Barnes and Noble. Of course, I made a beeline straight for the cookbook section. It is there that I came across the book The Cookie Dough Lover’s Cookbook, flipped through a few pages and decided that I needed it. But, it is so hard for me to buy books at the bookstore, when I know I am able to get them so much cheaper on Amazon. So, somehow I restrained myself and noted the title so I could order it that night. 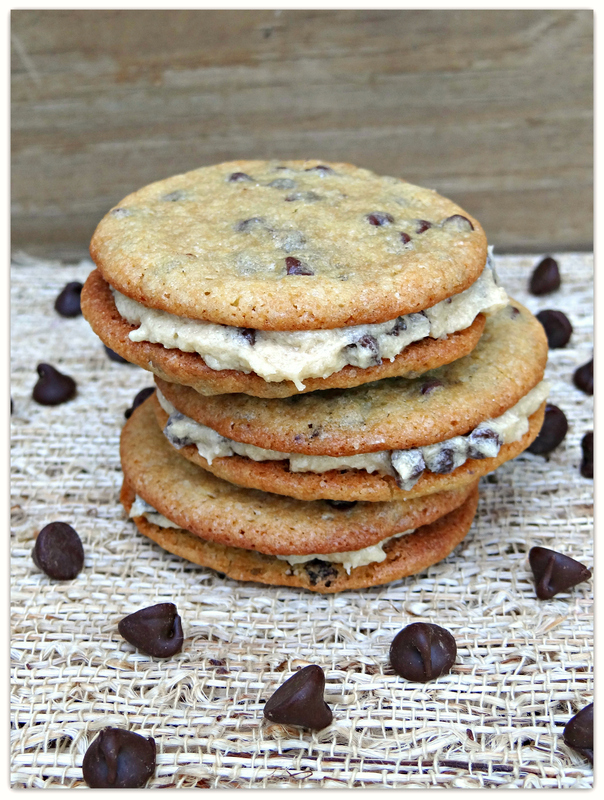 When the book arrived, I was flipping through it and I knew that I had to make the chocolate chip cookie dough filled sandwich cookies immediately. I mean, are you kidding me? 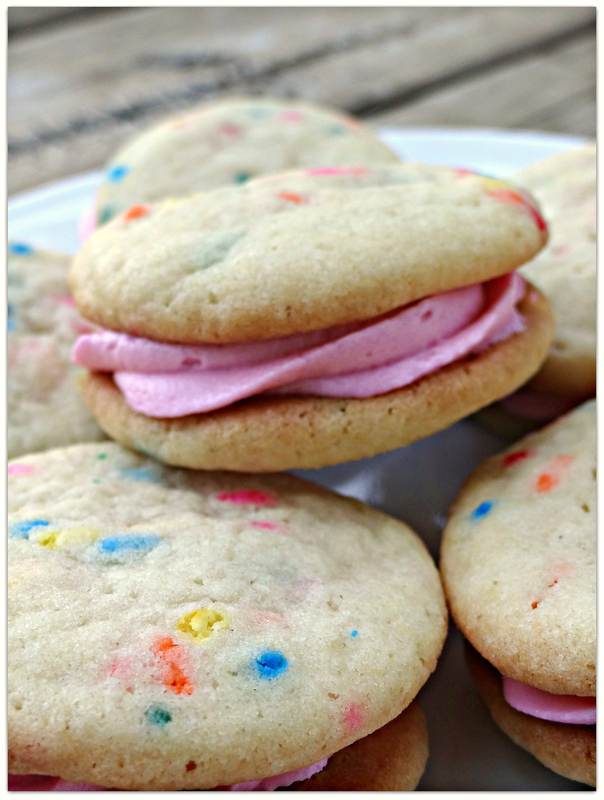 My favorite cookie, sandwiched together with cookie dough filling, which I may like even more than the cookie itself? Now, that is genius! 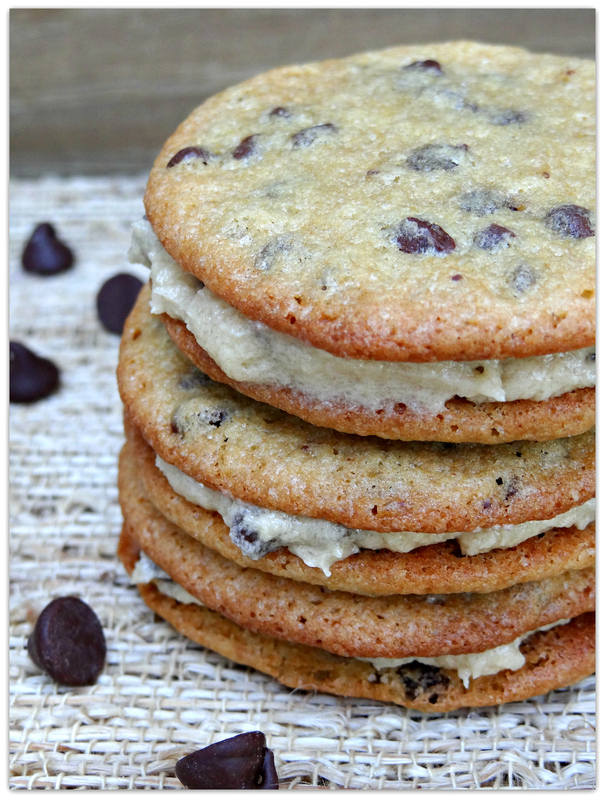 The cookie batter comes together easily, just like any other chocolate chip cookie dough. The cookies bake up flat, and a bit crispy on the edges and chewy in the middle. The cookie dough frosting tastes so much like cookie dough, I had a hard time not eating it all right out of the bowl. Okay, I admit it. I ate some. But, I still had enough to fill the cookies…well, most of them anyways. Filled or not, these cookies are simply delicious. As if there was any doubt. 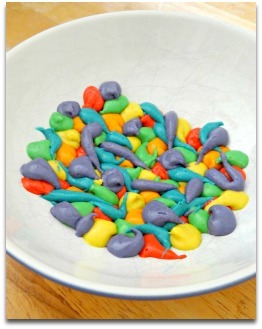 In a large mixing bowl, beat together butter and sugars until no lumps remain, 1-2 minutes. Beat in eggs and vanilla extract, scraping the sides of the bowl to make sure all of the ingredients are incorporated. Add flour, baking soda, salt, and mix until smooth. Stir in chocolate chips. Cover and refrigerate dough for at least 1 hour or overnight. Preheat oven to 350 F. Roll chilled dough into smooth, tablespoon-size balls, about 1 inch in diameter. Flatten balls slightly into 3/4-inch disks. Arrange about 2 inches apart on parchment lined baking sheets. These flatten and spread quite a bit. I suggest baking 9 cookies/sheet for your first batch so you can gauge size and spacing. 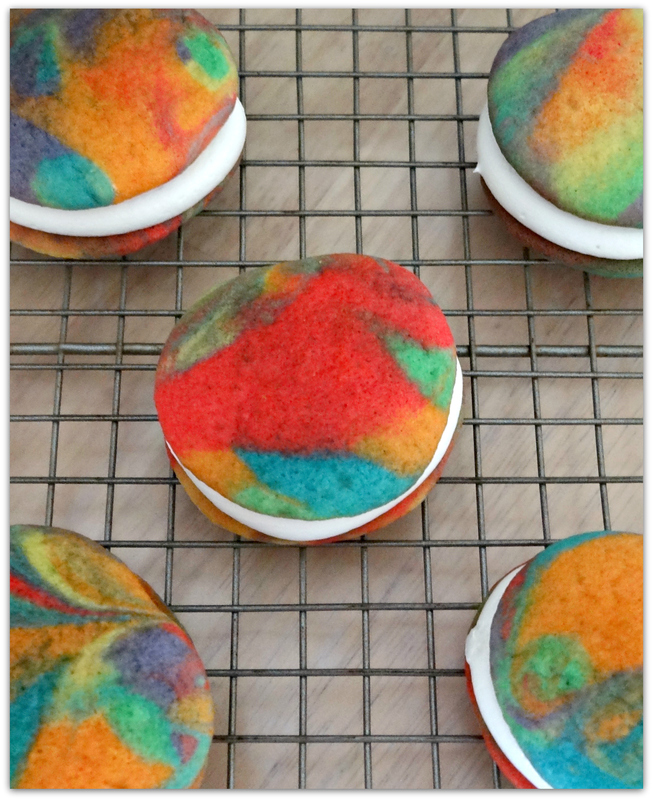 Bake for 9-11 minutes, or until cookie edges are lightly golden. Let cookies cool on baking sheet for about 5 minutes, then transfer to a wire rack to cool completely. To prepare the cookie dough filling, beat together butter and brown sugar in a large bowl with an electric mixer on medium speed until light and fluffy, about 2-3 minutes. Mix in flour, powdered sugar, and salt on low speed until incorporated. Slowly add heavy cream and vanilla extract and beat until fluffy, about 2 minutes. Stir in mini chocolate chips. To assemble, sandwich 1 heaping tablespoon of filling between two cookies. Press cookies lightly until filling spreads to the edges. Repeat with remaining cookies. Sandwiches can be stored refrigerated in an airtight container, for up to 3 days. Let them sit at room temperature for 30 minutes before serving. 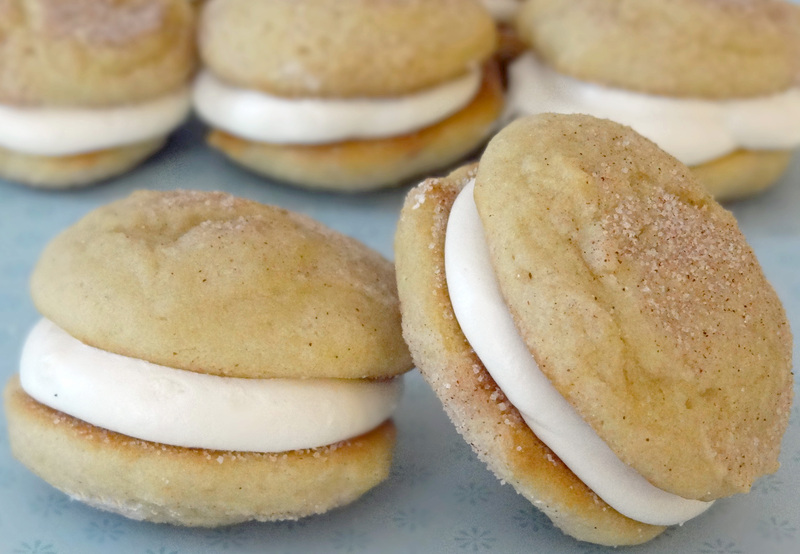 When I made the vanilla whoopie pies yesterday, I also made snickerdoodle whoopie pies. I just didn’t post them because my pictures turned out terrible. It’s not easy taking a pretty picture of something that is almost all brown 😀 Besides, these were so yummy, they deserved a post all their own. Follow the recipe for vanilla whoopie pies, except before baking, sprinkle the top of the batter liberally with cinnamon sugar. Bake according to the recipe. 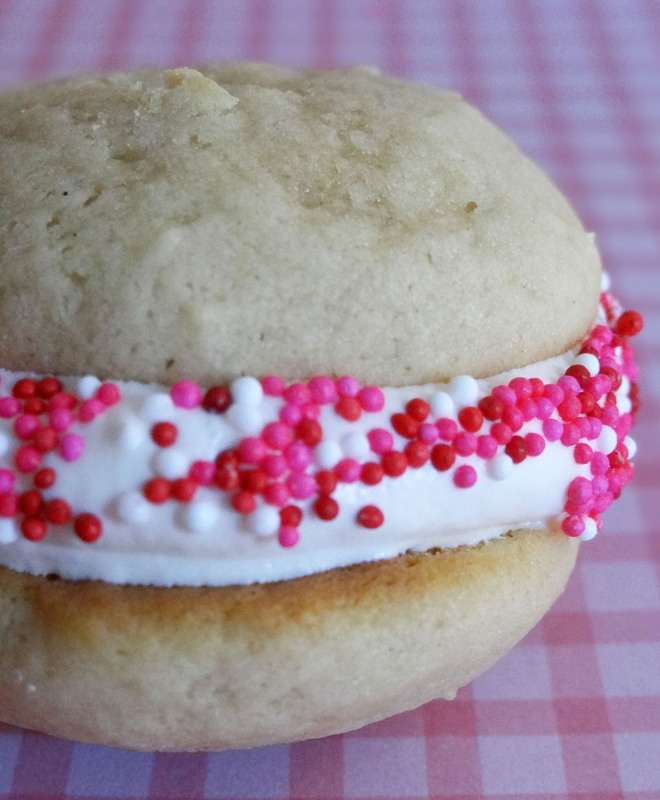 Whoopie pies (or gobs) are a popular treat in the Northeast, supposedly originating with the Pennsylvania Amish. 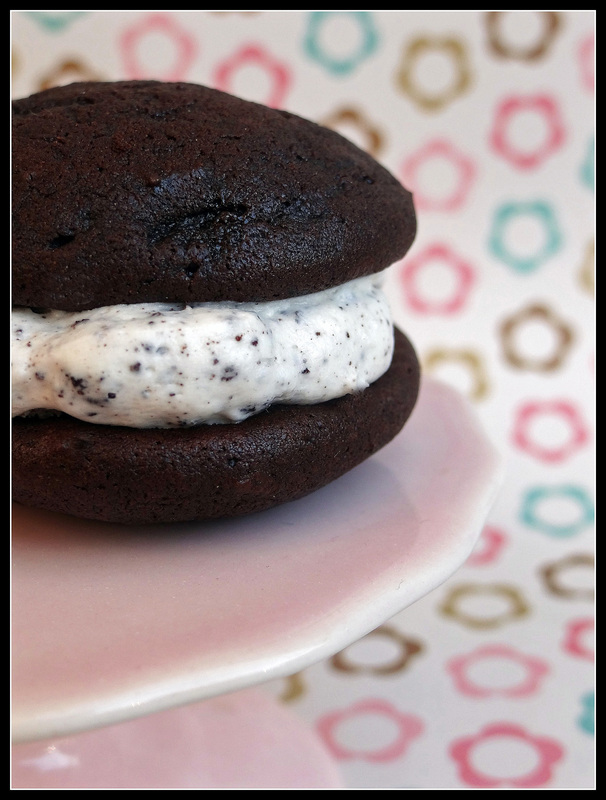 If you ask most people here in the Midwest what a whoopie pie is, unless they are a foodie, you’ll probably get a huh? 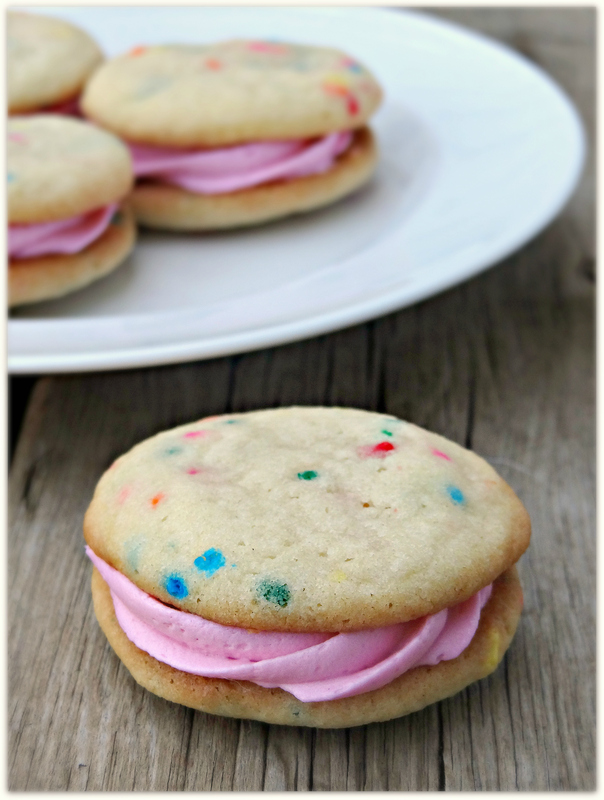 Basically it is a small cake, in the shape of a cookie, sandwiched together with a sweet, creamy filling. 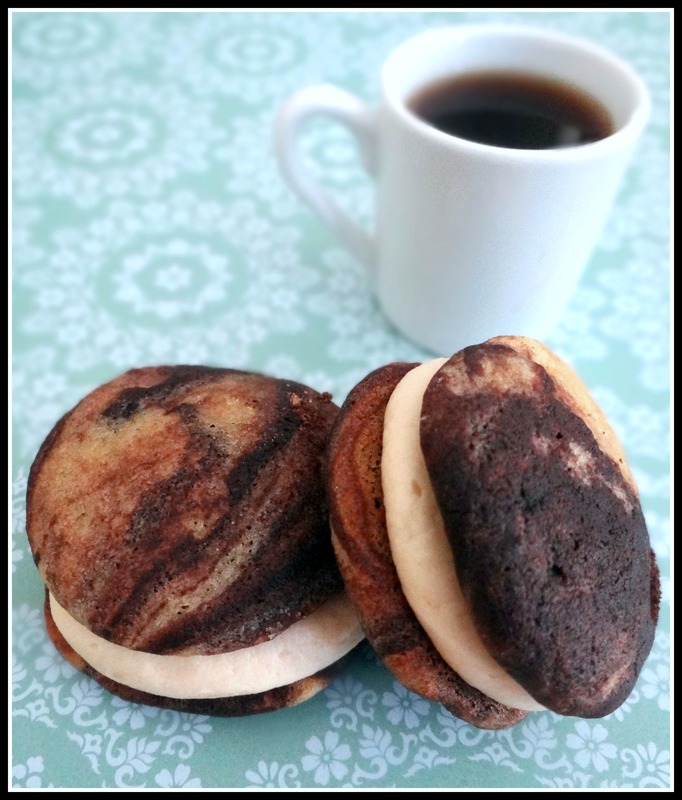 What’s so fun about whoopie pies, besides the name :D, is that there are so many different flavor combinations of cakes and fillings. So far, I’ve made chocolate chip and chocolate cakes and marshmallow and buttercream fillings. But, how about lemon with lemon mascarpone cream or banana with salted caramel or mocha with tiramisu filling? 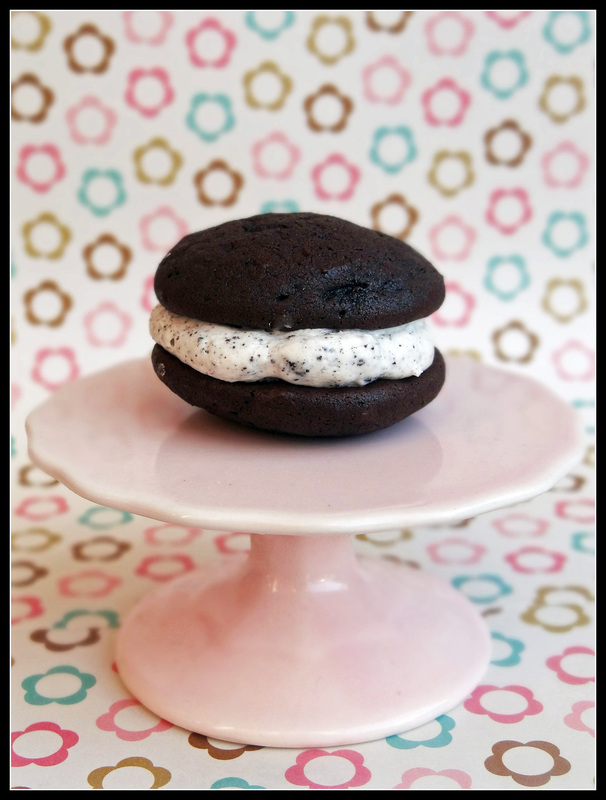 So many different whoopie pies to try…. Ahhh, I guess those are for another day. But, I’ll be sure to share. 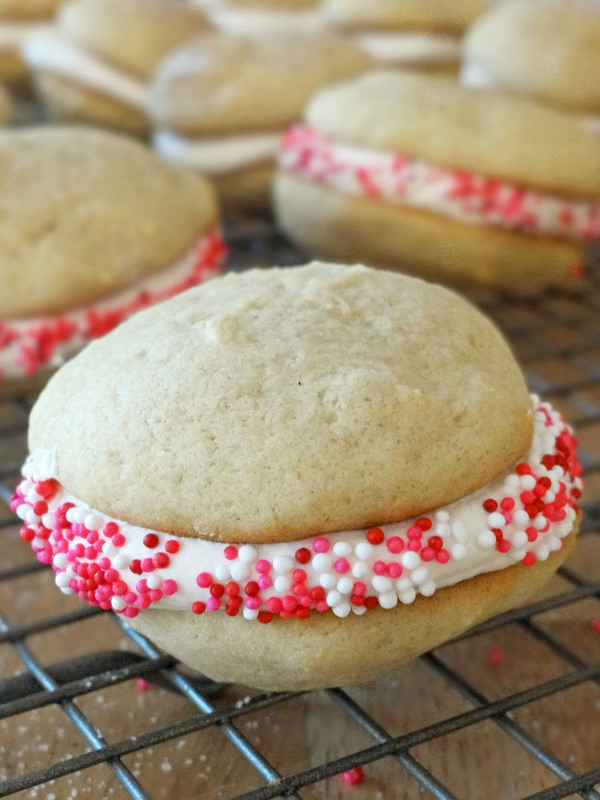 😀 Today I made vanilla whoopie pies with the traditional marshmallow filling. I have been making a lot of chocolate desserts lately and I thought it was about time I make something that my husband would enjoy. 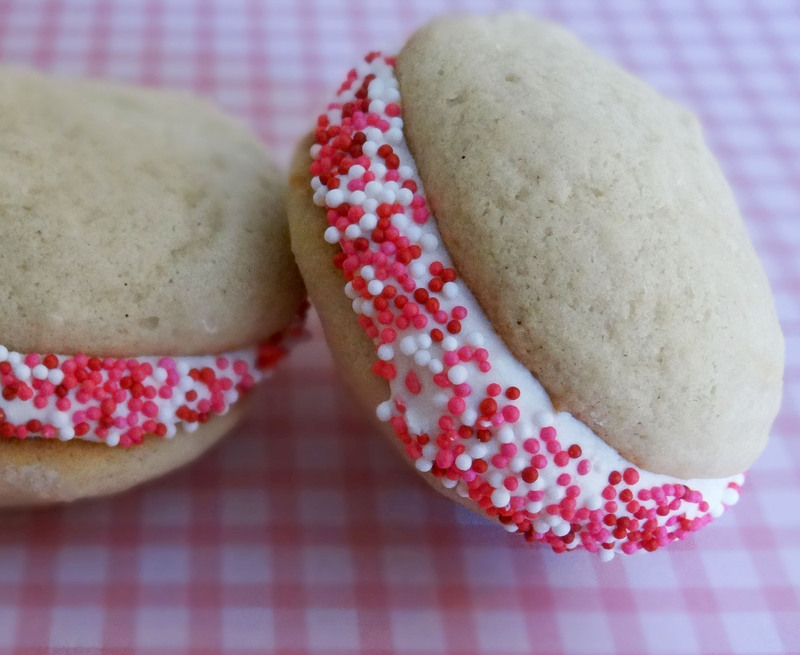 I decided to roll them in some red, white, and pink nonpareils to dress them up for Valentine’s Day. It’s right around the corner. Are you ready? 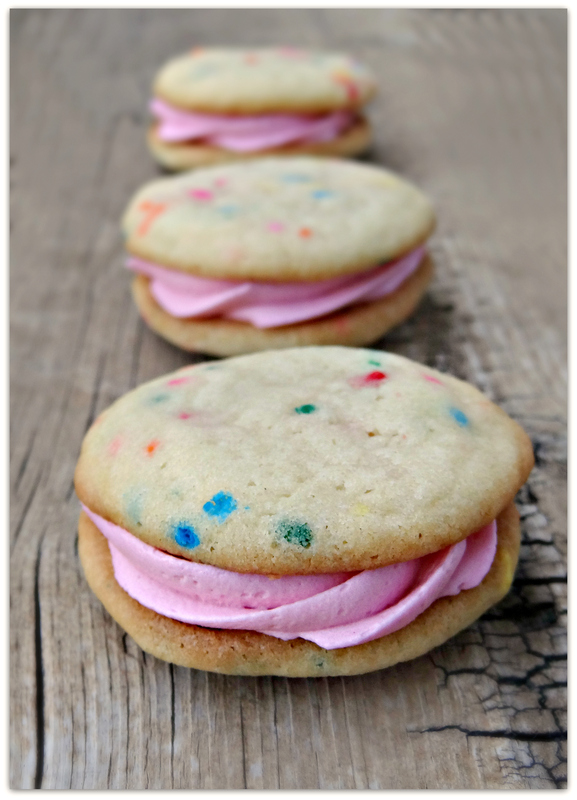 If not, here is a super cute, delicious, little hand-held dessert that you can make for your Valentine. I can bet they’re gonna love it! Mine did! Combine the milk, baking soda, and vinegar in a small measuring cup. With the mixer on low, add the milk mixture to the batter along with the flour mixture. Beat just until everything is combined. Add the vanilla and beat on medium for 2 minutes, until completely combined. Using a small cookie scoop (1 tbsp) , drop the dough onto the prepared baking sheets, leaving about 2 inches of space between cookies. (I got 16 cookies per sheet.) Bake the cookies, one sheet at a time, for 10 minutes (start to check at 7 minutes) , or until they are set and just beginning to brown. Let the cookies cool on the baking sheets for 5 minutes before transferring to a wire rack to cool completely.